Ohhhh yes. 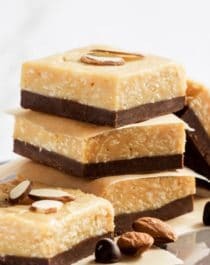 Almond Joy Candy Fudge. My heart just skipped a beat! It appears I did, but you can’t blame me… I mean, c’mon, just look at that bite! Chocolate and coconut pair like no other, but the almond extract is what brightens up each bite. It’s just as soft and sweet and chewy as the real-deal candy bar, all without the refined sugar, trans fats, preservatives, and artificial ingredients. 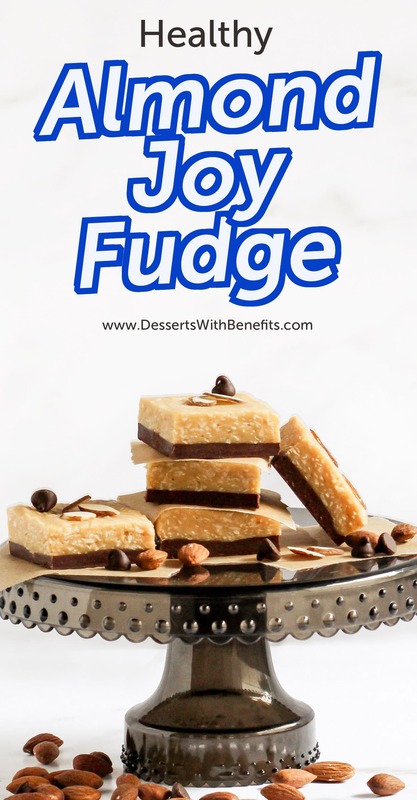 This Almond Joy Candy Fudge is healthy without the healthy taste! 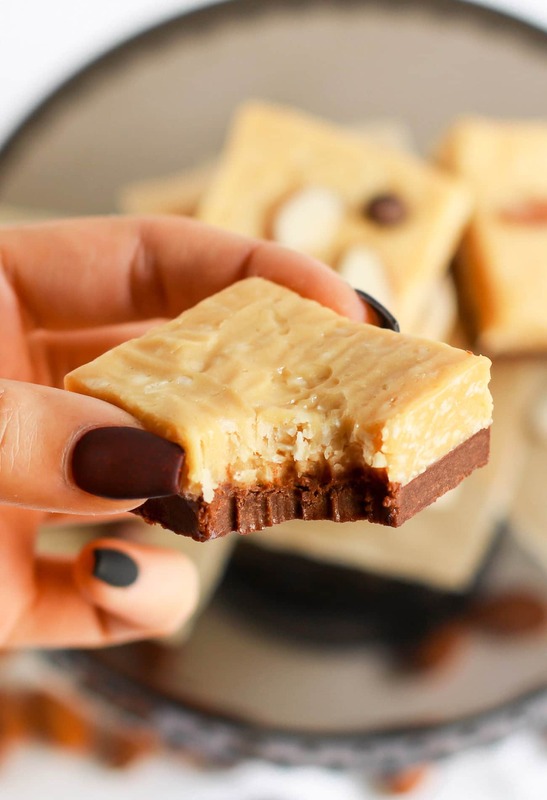 Yes, this fudge is refined sugar free, high fiber, high protein, and gluten free too! I still can’t believe it, and I’m the one who made them. 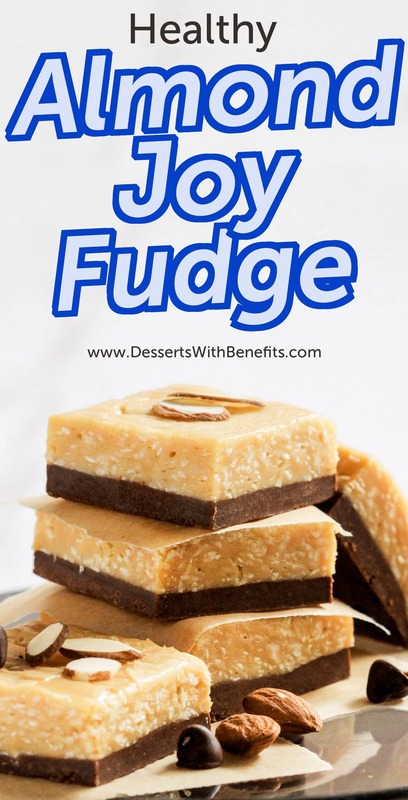 This Almond Joy Candy Fudge is healthy but doesn't taste healthy at all. It's just as soft, sweet and chewy as the original, but without the white sugar, hydrogenated oil, preservatives, and artificial ingredients. 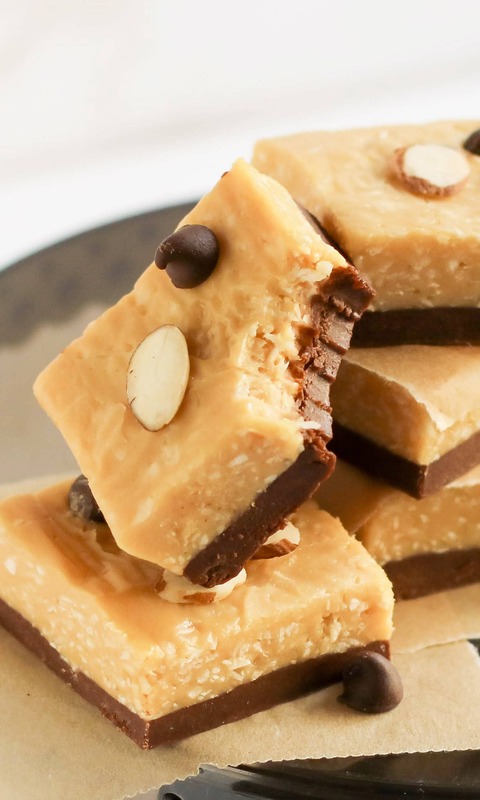 This fudge is refined sugar free, high fiber, high protein, and gluten free too! Line an 8x8” brownie pan with parchment paper both ways. In a small bowl, whisk together the protein powder, cocoa powder, and salt. In a large bowl, stir together the melted coconut butter and honey. Whisk in the coconut milk, then whisk in the almond extract and stevia extract. Dump the dry ingredients into the wet ingredients and stir together until completely combined (mixture should look like a dark paste). Scoop this into the prepared pan and spread it out. Press to flatten in an even layer. Place the pan in the fridge while you make the coconut layer. In a small bowl, whisk together the protein powder and optional CBD isolate. In a large bowl, stir together the melted coconut butter and honey. Whisk in the coconut milk, then whisk in the stevia extract. Stir in the shredded coconut until completely combined. Scoop the mixture over the chilled chocolate layer and spread it out. Cover and refrigerate overnight. Slice, serve, and enjoy! Feel free to press whole almonds onto the top layer before refrigerating! Okay, that officially looks awesome. I’d have to sweeten with other things but I may have to take a stab at making this low carb! Wow, another decadent recipe…nothing is better than an almond joy! Love your site Jessica! I just nominated you for the Versatile Blogger Award. I just found your site and now im in love with it. But im just wondering instead of protein powder can we sub something else in like coconut flour or almond meal and i’ll just bake it instead? You might be able to replace the protein powder with those flours but I wouldn’t recommend baking it. It will most likely turn out dry and crumbly. Start by adding the flour of choice 1 tablespoon at a time, then stop once you get a thick fudgy texture. I hope this works out for you! Ummmm, where can I find raw coconut butter? Thanks so much! It’s linked right there in the recipe (click on the ingredient). I also included the link here. You can also find it cheaper on Thrive Market (a subscription based Amazon-ish site specifically for healthy food)!